"It was the beginning of the end," Napoleon's former foreign minister Charles Talleyrand said. After Napoleon's lost most of his army in Russia, Britain, Russia, Prussia, and Sweden united against him. Only Austria, ruled by his new wife's father, wavered. But they wouldn't remain neutral for long  all of Europe smelled blood with Napoleon's defeat. "My star was fading," Napoleon said. "I felt the reins slipping out of my grasp, and could do nothing to stop it." HORNE: But the remarkable thing was he managed to, yet again, produce a new army. He still had the extraordinary mystique that he could look Frenchmen in the eye and say, "Soldier, I will give you victory." Clinging to the hope that one decisive battle could turn his luck around, Napoleon rallied France for yet another campaign in central Europe. He battered the Allies at the battles of Lützen on May 2, 1813. The two sides signed the Armistice of Pleiswitz a month later, giving each side time to recover. With little time to maneuver, both Napoleon and the Allies turned to Austria, hoping to persuade them to enter the war on their side. Napoleon greeted his father-in-law's ambassador, the dashing and arrogant Clemens Fürst Von Metternich, with icy disdain. Metternich told Napoleon that Austria would remain neutral for a "ransom"  which included returning some territories taken from them by Napoleon in previous campaigns. "I will give you nothing because you have not defeated me," Napoleon shot back. "So it's war you want," he added, "You shall have it. I will beat you." "But I have seen your troops," Metternich coolly replied, "they are boys and old men. You are lost, sire. I am certain of it." On August 12, 1813, Austria declared war on France and joined the Allies on the battlefield. The allied generals, after suffering defeats for nearly two decades, had by now learned how to fight back against Napoleon. CONNELLY: One thing the allies had learned was that they had to fight together. They agreed never to fight an army if Napoleon was in command. If one of his marshals was in command, to go at him full force. And this worked. In the fall of 1813, the Allies caught Napoleon at Leipzig where they outnumbered him two to one and punished his armies in a bruising battle that lasted three days. 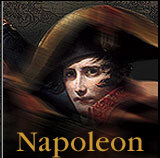 Napoleon dealt them a defeat at Hanau on October 30, but the legend of Napoleons invincibility was over. His armies were now in retreat everywhere in Europe. "A year ago," he said, "the whole of Europe was marching alongside of us. Today the whole of Europe is marching against us." Holland was lost to the Empire on November 13. The Austrians occupied Switzerland on December 30, threatening the borders of France. The tide of war was running against Napoleon; in two months he lost 400,000 men. Still, he fought on. "There was nothing left to do but fight," he said, "yet every day our chances grew smaller and smaller." By the beginning of 1814, Napoleon was again in Paris when he learned that the Allies had invaded France itself. Throughout the winter and spring, Napoleon defeated larger Allied armies at Brienne, Champaubert, Montmirail, Montereau and Rheims. It was a desperate campaign, and Napoleon fought with all his old brilliance. But 85,000 Frenchmen stood no chance against 350,000 allies. HORWARD: He was just fighting here, fighting there, fighting the next place, hopelessly outnumbered, could never win, but still fighting like mad. Trust me." On the morning of January 25, they said goodbye. He would never see his wife or his son again. On March 31, 1814 the Allies marched down the Champs Elysées. The war was all but over. Now even his own marshals turned against him. When he prepared to summon what remained of his army to march on Paris, they refused to fight any longer. 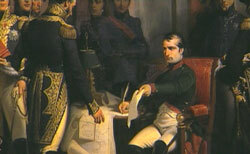 On April 12, 1814, Napoleon picked up a pen and renounced his throne. Once master over an empire of seventy million people, he would now become the emperor of the tiny island of Elba. His enemies thought Napoleon's exile would bring peace to Europe. Napoleon had other plans.